Updated with a new foreword by Moss Roberts for this fifteenth anniversary edition, Three Kingdoms tells the story of the fateful last reign of the Han dynasty (206 B.C.–A.D. 220), when the Chinese empire was divided into three warring kingdoms. Writing some twelve hundred years later, the Ming author Luo Guanzhong drew on histories, dramas, and poems portraying the crisis to fashion a sophisticated, compelling narrative that has become the Chinese national epic. This abridged edition captures the novel's intimate and unsparing view of how power is wielded, how diplomacy is conducted, and how wars are planned and fought. As important for Chinese culture as the Homeric epics have been for the West, this Ming dynasty masterpiece continues to be widely influential in China, Korea, Japan, and Vietnam and remains a great work of world literature. Moss Roberts is Professor of Chinese at New York University. 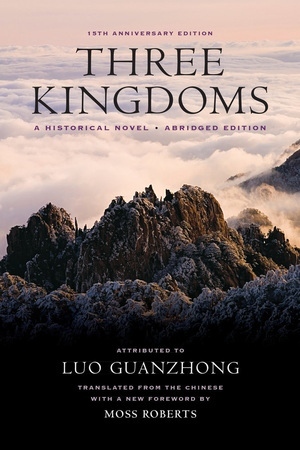 He translated Dao De Jing (California, 2004) and an unabridged edition of Three Kingdoms (California, 1991) and is the translator and editor of Chinese Fairy Tales and Fantasies (1979).